For the past thirty days, you have been “PERSISTING” in lifting your thoughts. Have you noticed a difference? 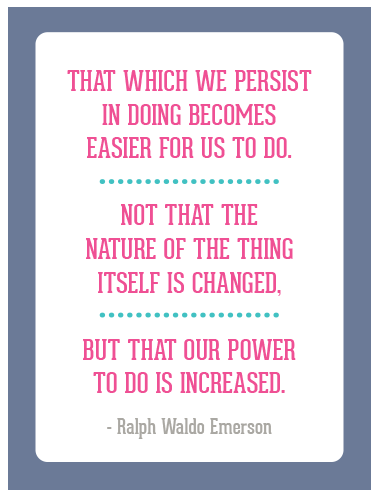 Has anything become “easier” for you to do than when you first started? Where do you go from here? My hope for you is that this challenge is just the beginning of your journey, not the end. My hope is that it has inspired you to dig down deep, to look for the best that is inside of you & others, and to have the desire to learn more. I have found in my own personal journey that: KNOWLEDGE IS POWER. The more I seek, study, learn, & then APPLY the things that I am learning….the more power I have to BECOME my best self. I have also found that when you put your relationship with your Heavenly Father first, everything else will fall into place. Starting on November 1st, I will be doing my “Thirty Day GRATITUDE Challenge” again here on my blog. This is a great way for you to continue to work on your THOUGHTS as gratitude is one of the best things you can do to raise your thoughts to a higher level! I hope you’ll join me for another thirty days & help spread the word! I would also love to hear how this challenge has helped you in your life! Please share your thoughts in the comments below! *NOTE: I am working on turning this challenge into a printable format that you can purchase & print out at home. I don’t have an exact date when that will be ready. All I know is that it will be available some time before the end of the year. As long as you are signed up for my newsletter, you will be sure to know when it becomes available! Day 30! I’m not sure I’ve ever committed to anything for 30 days! Lol! Thank you so much for guiding us on this journey. It has opened up my eyes and my mind. I see now that this is the beginning of something so much more. Thank you. Almost forgot, will you have the quotes available to purchase in your store like you have done before? I want to make an album/journal so I can have it to study further. Thanks again!! I came on this near the end of the 30 days, but I’ve been reading lots of the posts. Now I want to slow down and actually take the 30 days to read them again and work on my thoughts – this came at a great time for me! Thank you for the work you put into this. I wasn’t able to make daily comments as the previous challenge, but I did enjoy it and looked forward to put the daily quote on my phone everyday to look at it. I am so grateful for you and what you do to help others. I look forward to really looking into this challenge more when my schedule slows down, just a little. Thank you for all that you have done and continue to do. I miss you guys so much!!!! Loved these Crystal! I read through all 30 this time and feel like I need to go back and really study them again one at a time. I think I could spend at least a week on each one! I’ve realized that I need to start a journal again, it’s been way too long for me. Thanks again for all of your work and effort to help the rest of us! Hugs to you. Hi- I loved this challenge. Thanks again. I stopped around day 24 so I’m starting again tomorrow. Thanks for all your help. I learned a few things about myself…….mostly that if I don’t have all your posts printed off in my journal I can’t really digest them. So I’m off to print them off to start again. Thanks so much. I think you are amazing. Thanks friend. It would be AWESOME if the 30 Days Thoughts Challenge was available in a journal format like the Gratitude one I purchased from your shop last year. Makes a great gift for others as well in the 4.25″ bu 5.5″ size. I woke up everyday for the last 30 days looking forward to read your daily post. I have been enjoying every single one. I want to thank you for being a bucket filler. I also learned about that during this month with the book: How Full is your bucket? And it was related to the challenge in a way. Today a have mix feelings as this comes to and end like when you finished a good book. I am ready to start 30 more days of lifting our minds and souls with the gratitude challenge. Many blessings for you and your family. How do you get the newsletter? I would love to get this in the printable format! Where is that located? Thank you! !